I’ve been talking a lot about how much I like 5e’s advantage and disadvantage (adv/dis) rules for how smoothly they flow from the fiction. It seems like a state that you can describe verbally or in text, and they simply have it reflected in the mechanics. 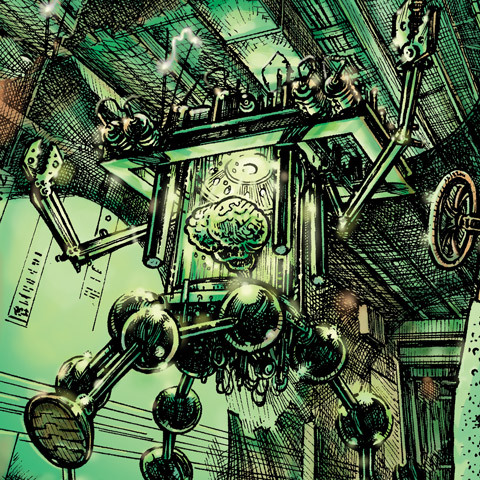 It does not hurt that the die mechanic is nicely elegant, but it could just as easily be a +/–2 (the default modifier for winging it in past editions of D&D) or +/–1d6 or some other mechanic. That is, in fact, the point – the concept is clear but broad, so there is no mechanically correct answer, so the concept can be applied across multiple mechanics. Thus, for example, the idea is easily translated to Dungeon World, replacing the +1/–1 forward rule. To echo the 5e mechanic, add an extra die to the roll if you’re at an advantage, and drop the lowest. If you’re at a disadvantage, do the same, but drop the highest. The math is a little bit different than +1/–1 (more like +/–1.5) but it feels pretty good. The idea is a little bit tricker when you move to systems that produce less linear results. Consider, for example, the storyteller/storytelling system from White Wolf, or any similar. There’s no real idea of a “negative” success, so adding dice to the roll for extra effects would just be weird, and adding them for a bonus would be pretty normal. You could just say that adv/dis is +/–3 dice, and that would probably work ok, but you also might look elsewhere in the system. For example, since success is on a 7+ on a d10, perhaps adv/dis changes that to a 6 or 8 respectively. That’s pretty potent, but it has the advantage of still producing results within the original curve, which is a heretofor unstated design goal. Cortex solved this problem (under a different name) by effectively making adv/dis d4/d8. If you add a d8 to a roll, it’s pretty likely to bring up your total. if you roll a d4, it’s unlikely to improve the roll at all, and it’s likely to roll a 1 (a bad thing). It’s interesting to me to be able to carry this concept across systems (for reasons which may merit their own post) so, of course, I wonder how this may be applied to Fate. There’s an instinct to head straight to the Aspects system, since it seems spiritually similar, but that sits wrong with me. The least interesting part of aspects, to my mind, is their bonus or penalty, and the fact that it stacks is already a complicating enough factor to my mind. However, if one really wanted, they could stop right here and just say that the situation causing advantage or disadvantage is reflected as an aspect, and that would work just fine. But I like the adv/dis terminology, and I’m happy messing with the guts of Fate, so I think I’ll mess with this a little. Now, back in the day (pre-SOTC), the aspect bonus worked a little bit differently than it does today. Rather than a flat +2, it was “reroll or flip one die to a +”, and that had a number of interesting implications. The first time you used an aspect it was probably going to change a – to a + (thus the +2) but after that, you were going to hit diminishing returns very quickly as you ran out of -’s and had to flip blanks (for a +1) and you’d cap out at ++++, no matter how many aspects you had. I confess, I like this mechanic better in general – it rewards aspect use without rewarding huge aspect stacks. However, our SOTC playtesting largely determined that die flipping was a little bit too fiddly for most players. This made me sad – I like dice flipping – but sometimes you need to toss out a mechanic you like based on feedback. I instinctively want to discard #1, since it introduces the possibility of a +5 or –5, and it also required keeping track of which die is the extra die. I might be willing to track die colors if there was a specific mechanic to hang off it, but for this, it seems frivolous. 2 and 3 both appeal. Adding in an extra die is a little bit weird in a Fate context, since it violates the usual “4 dice per player” rule, so that’s a strike against. However, the action of adding a die is a bit of fun physical engagement, and allows it to be tossed in after the fact. Those might be a wash. In contrast. #3 is super easy to implement because you can just read it from the dice, but that’s also not terribly engaging (especially when it doesn’t actually impact the roll). So, when in doubt, let’s do some math. Looking at those numbers, I admit I’m leaning towards “drop worst”. The fact that +4 is no more likely (really, identically likely, but I suspect there’s a rounding error at work) is a plus, though in all honestly, that is a fine point that gets steamrolled by aspect invocation (a fact I will give some consideration to later). 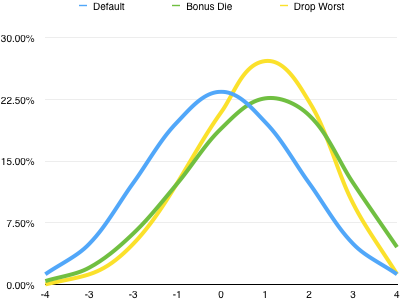 Given the impact of aspects, the somewhat smoother curve of “add a die, drop worst” might make more sense. For the moment, I break the tie in favor of “drop worst” because it requires no extra dice, but I’ll be chewing on it for a little bit. This entry was posted in Uncategorized and tagged 5e, Fate on July 30, 2014 by Rob Donoghue. Just out of interest, what about just rolling two sets of dF and keeping the worst result if you’re at a disadvantage and the best result if you’re at an advantage? Aside from needing 8 dice (or remembering the roll and re-rolling) it seems to me that it would work fairly well? The need for two sets of different colors is non-trivial, but it’s also just kind of awkward in practice. For me at least, I need to physically separate the dice, or actually think about the dice rather than just read by instinct. That said, if you have a deck of fate, “Draw 2, keep best/worst” becomes trivially easy. Which actually reflects a nice thing about the idea – do it whichever way suits the tools you have on hand. I’m always leery of card based systems (I’ve had a love-hate relationship with the use of cards in Savage Worlds, for example, since I encountered it) but this use of the Deck of Fate is just perfect. That’s true. Of course people who are used to Exalted might love the chance to roll 8 rather than 4 dice, so in certain circles that would be a feature rather than a bug. It’s also a good excuse to use those billion Fate dice everyone has after the Kickstarter! Couldn’t advantage allow you to reroll your failures, and disadvantage force you to reroll your successes? Just as a parallel structure, and one that would encourage you to spend the Fate Point to reroll out of that mess. Yes, but I’m trying to resolve it in a single roll. I was thinking, and strangely I’d been thinking about this for a while, to just put down a die at a – for disadvantage and a + for advantage and roll the other three. simple, playable and show cases advantage in a tangible way. The idea of locking a die like that is excellent! I love die locking conceptually, but it always seems a little flat at the table. That said, perhaps I should run the numbers to see how it measures up. In order to do so, I used 8 Fudge-Dice (2 per player). I placed them in the middle of the table, whenever the group decided on a new goal within the story arc. Players were free to reward each other with those dice. It worked like a charm. Nobody did mind throwing 5 dice. But since it was explicitly about fanmail, a physical representation was very convenient. Rather than adding a 5th die, players could simply reroll their lowest/highest die. As an aside, advantage/disadvantage as in 5e is also very conducive to the idea of “bounded accuracy”. It also increases the chance for crits. Another big thing I like about advantage so far is that it’s not something that is applied after the roll. Which kind of lessens the “Oh, no, I’m falling. No, I’m not. Yes, I am.”–feeling that’s a mixed blessing in Fate. I’m eager to see how it plays out. Obviously, it seems that advantage/disadvantage, inspiration, and the t/i/b/f owe a lot to Fate, which is one of the reasons I really, really hope that they have an open license. As far as I understand it, the message is “We will reveal our license plan in early 2015 so don’t ask until then” is a bad sign [amid plenty of good signs, hints and rumors — but we have a tendency to believe what we want to believe]. The changes from Fate to 5e, however, doesn’t seem gratuitous. The latter is not all upside but hopefully that will lessen the “What’s an aspect?” confusion. One issue we had when we first started playing Diaspora was that the new players were confused about what skills were and what aspects were. To me, skills are what you do things with and aspects either modify how you do them, or is a reason why you do them. That’s not something that is super clear. To get back on the topic of Fate directly, I was long tempted [when I played Fudge, throughout the 00’s] by the idea of introducing special dice, i.e. dice with +/+/_/_/_/_ and _/_/_/_/-/- for example, that you would add when you had a small edge. When I had my home made dice briefly, I made some of these. But the idea soon got cold on me because it just felt confusing. They were a bit too similar and it became hard to explain or manage. If you went with D6-D6, an advantage could be “roll 2 positive dice, pick the higher”, and a disadvantage could be “roll 2 negative dice, pick the higher”. True, you get the swingy D6-D6 thing, but the advantaged and disadvantages work out nicely.